CUTE couple! Brimming with nostalgic charm, this adorable personalized couple Christmas ornament will melt your heart. Resin. 4" long x 3/4" wide x 3 3/4" high. Specify names; limit 2 lines, 10 letters/spaces each. We’ll personalize for one special couple. adorable addition to any Christmas household during the holidays!! It can be hung on the tree or anywhere in the home! Christmas gift or just a little personal gift to yourself!! I love this. After being together for a while it makes me smile to see us as a cute couple again. Very cute, and pretty. A perfect gift. Ordered this in my grand daughter & her new hubby...adorable and just right for their Christmas. It's perfect for my grandson and girlfriend. Top quality. I was very happy with how clear the lettering came out. I love how colorful the ornament is. I am a shopper on a budget and wanted to get something nice for my friends who have everything & this ornament was a perfect gift for them. It is a high-quality item with a double hanger on the back so it does not bend the branch it is hanging from on their Christmas tree. I am very pleased with this purchase from Miles Kimball & will purchase items like this in the future. My wife and I are very pleased with our purchase, we purchased a similar item last year and love to add to our tree each year. This was a very adorable addition to our tree and will be treasured for years to come. I would buy this ornament again! I can't wait to give this ornament! It's really cute! I bought 2 of these for my grandsons. Had their names and girlfriend names engraved on them. They loved them. This ornament was well made, good size and just adorable. It was a gift for my son and his girlfriend for their 1st Christmas together. They loved it. Christmas gift for my grand daughter and her boy friend. This is a nice ornament for couples , I purchased 2 for our tree with my and my husbands name. Then I ordered one for our neighbors . This ornament comes with 2 strings connected together to hang it on the tree . It weighs more than other ornaments so you must hang it on a sturdy branch . 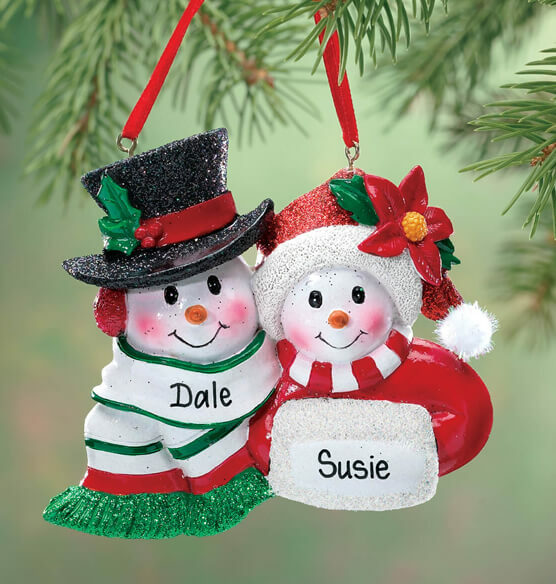 Love "Snowmen Couple" ornament and it will be a great addition to our collection. The only suggestion I have is to add the year to ornament. Since there was no area to add date to personalization, I had to add myself when received. Beautiful Christmas Tree decoration. Precious keepsake. Ornament is exactly as described and nicely painted. Used as a Christmas tree ornament. The detailing is nicely done. I only wish the names printed on it was a little darker.